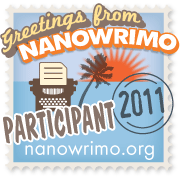 I’ve made my reasons for not participating in the classic Nanowrimo event rather public. If you haven’t seen them, they’re available on Unleaded. So I’m not going to rehash them here. What I will do is wish luck to everyone who is finalizing their outlines, limbering their fingers, auditioning their coffees, and otherwise participating in any of a number of pre-Nanowrimo traditions. Myself? I used to always stay up until midnight and write my first sentence, then go to bed. Of course, the Nanos that I participated in tended to start on weekends, so this was more fitting with my schedule as a person with a day job. So good luck! Don’t take my lack of participation in any way as looking down on the event. There are plenty of bloggers who will do so during the course of the next month, and I’ll probably end up taking one or two to task, it’s another of my annual Nano traditions. However, please keep a few things in mind. I’m sure I don’t have to tell this to anyone reading this blog, but what you’re writing the next thirty days is a rough draft. Nothing more (though in my own experience, occasionally less). Don’t be that person who is sending their manuscripts out to agents or publishers on December 1st. Yes, those people exist. Yes, those people are why Nanowrimo has a bad reputation in some circles. It makes it easier for me to defend the event if people aren’t doing indefensible things at the end of it. Have fun. Say you’re writing a novel. Yes, that makes you sound pretentious, but everyone needs a little pretension in their lives. If this is your first time, remember, it’s not easy. During one of the hours of Flashathon I mentioned a running term: the wall. Novel writing is an endurance activity, and it is possible to hit that dreaded wall. But keep going, keep pushing through. This is, in part, where an outline may help, but not everyone is an outliner. In that case, take a cue from compass-less orienteering. Find a distant waypoint. Keep pointing towards it. If you have to go around an obstacle, do so with the waypoint in view. If you have to look away, find it again quick. It’s possible you’ll decide on a better waypoint as you go, but always think more than a few sentences ahead. So what about me? What will I be doing this month? I’ve given myself another project, working half an hour a night with my wife on our joint novel project Nickajack. This will be outlining and character development early in the month, it should hopefully be actual writing by later in the month. We discovered we got a lot done during three weeks where we were eating out every night and talking about the novel over dinner. We want to keep that momentum going. I’ll likely be tracking my progress towards that goal more on Twitter and Google+ than in here. I’m sure anyone who’s read this has heard about the Cooks Source kerfuffle today. To sum up for those who haven’t: the internet is not public domain. For those who don’t know what I’m talking about, the best summations I’ve heard come from Gizmodo and (oddly) woot. For some entertainment related to this, there’s the @cookssource twitter account (note: not actually the Cooks Source twitter account). So here’s what happened. A few months ago, while I was creating my new blog I somehow managed to corrupt my old blog’s database in some horrible unrecoverable way. At that time, it had been over a year since I’d gotten any comments on the blog, and hadn’t made a new post in several months. Additionally, I was relying largely on Unleaded to replace my blog, since I was making weekly posts there. And that was okay, but there was something I missed about having a blog. Well, this weekend is Capclave here in DC. And, among the other panels I sat in on, one was hosted by Tee Morris about what a writer’s presence on the internet should be. It really just inspired me to reopen this blog and start it again from scratch. And hopefully use it a lot better than I ever used it before. Gone: The old name of the blog. It was such a spur of the moment decision that I liked less and less as I went (and really constrained post titles in a way that was starting to annoy me). New: I have an email address! I mean, I’ve always had one, but now I’ve got an address @DLThurston.com It feels so professional. New: Short stories. I’m planning on posting the occasional flash piece here. The plan is for the series to be called “Fortnightly Stories”, which will create a much better schedule than the old Thing A Week idea did. New: Twitter! Well, not yet, but part of the Tee Morris talk had me thinking that maybe it’s time for me to stop being Mr. Luddite Head when it comes to Twitter and Facebook. Except only Twitter. My wife actually grumped at Tee for this, “why did you tell my husband to join Twitter?” To make it clear, he didn’t tell me. If I make the decision it’s of my own accord. Gosh. New blog. Or renewed blog. I’m going to see if I can backdate some posts and bring over some of my Unleaded contributions. Unfortunately, everything else is just gone. It’s a shame, but it was time to get the hell over it and get started again.